What I love about photography the most is having the opportunity to learn about new things. I didn’t know very much about the Russian Orthodox Church here in America, so when they called and asked me to photograph The Metropolitan it was my chance to further educate myself. – Started when, in 1794, eight Russian Orthodox monks traveled to Alaska (then part of Russia). – By the late 1800’s, due to the large immigrant population from Europe and the Middle East, the Church grew and spread to other areas of the United States. – There are now estimated between 27,169 to as high as 1,064,000 members of the Church in the United States. I’m not sure why the numbers vary. – The Metropolitan is the head of all the bishops in the Americas (US and Canada). 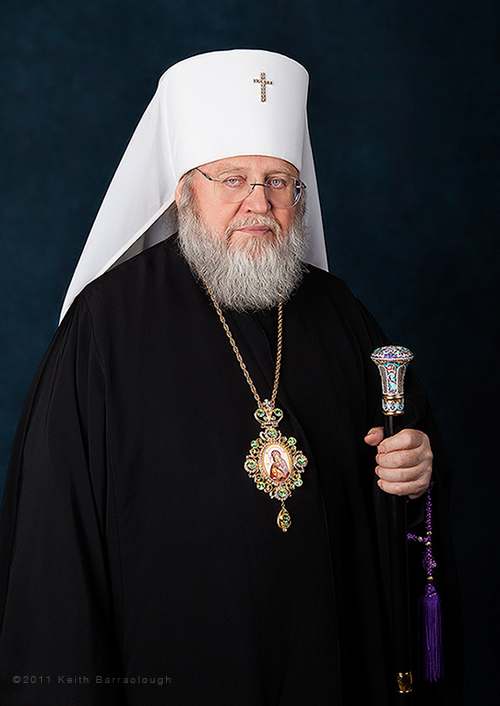 – The metropolitan is elected by the Holy Synod at an All-American Council. There are no age or term limits for the metropolitan, and he may retire at any time, but usually does so only for health-related reasons. He is similar to the Archbishop in stature. Other than lugging equipment through and on the Subway (always a fun ordeal…), there weren’t any obstacles to over come on this shoot. We shot at his residence. Rearranged some of his furniture and set up the lights. As with many official portraits of clergy, the Metropolitan stood with a very stoic look. He is, in fact, a very friendly and pleasant person. As I usually do after the shoot is finished I ask if he wanted any less posed shots. He said “I was just in Florida with alligators and got some shots with them.” I asked if he blessed the alligator before holding it. “No”, he said, “I blessed myself.” I don’t blame him.